The providers that will be protected from adult education budget devolution have been announced. Certain providers will continue to be funded nationally by the Education and Skills Funding Agency for two years between 2019/20 and 2020/21 after devolution goes ahead, the skills minister confirmed in Parliament last week. They have now been named, and feature providers which qualify for a “residential uplift” for their learning provision, which receive more than two thirds of their income from the AEB, and which “predominantly target their provision at the most disadvantaged in society”. They are Fircroft College in Birmingham, Hillcroft College, which now part of Richmond and Hillcroft Adult and Community College in London, Northern College in Barnsley, and Ruskin College in Oxfordshire. A government spokesperson said that this will be “to aid their transition to devolution/delegation given their specialist nature and reliance on AEB”. Traineeships for 19- to 24-year-olds will meanwhile “remain a nationally funded programme” with allocations provided by ESFA, regardless of where trainees live. But providers were advised to prepare for widespread handover of responsibility from local to central government. “Providers who wish to deliver AEB provision, post devolution/delegation, in one or more of the mayoral combined authorities and Greater London Authority areas should start to build, if they have not already done so, effective working relationships with the relevant authority,” the spokesperson said. The “final AEB to be devolved” to the mayoral combined authorities and delegate the AEB to Greater London Authority for the 2019/20 funding year “is expected in early 2019”, once “the functions necessary for the delivery of adult education have been transferred” and the AEB budget for that year has been finalised. 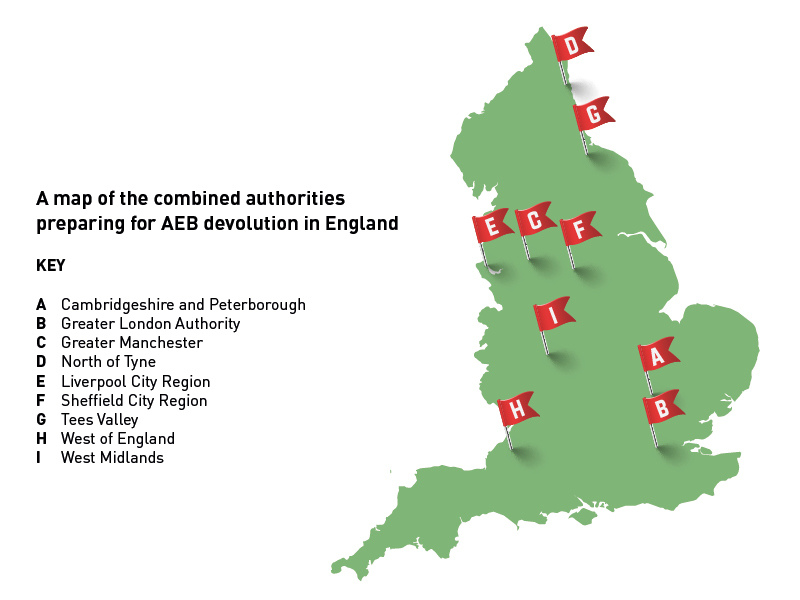 There has been widespread dismay at the lack of information on how AEB devolution will work in practice. FE Week reported in February that the regional mayors tasked with overseeing devolution had met the Department for Education to “voice concerns” over the process. High among their issues was a lack of influence over the budgets, and not enough funding funding during the transition year, as well as what were described as “challenging” timescales for the handing over of power. “As part of the preparations for devolution/delegation the DfE has issued illustrative AEB allocations for 2018 to 2019 to MCAs and the GLA,” the spokesperson added. FE Week has asked to see the illustrative allocations. “These illustrative budgets give MCAs and the GLA an indication of the AEB they can expect to receive in the funding year 2019 to 2020,” they said.